17-Oct-2006 -- After finding the Confluence.org website I had dreams of being the first to knowingly reach and photograph one of the confluence points. Unfortunately, I soon found most of Europe's confluence points had already been 'discovered'. I searched further and realised North Africa had a few points left untouched (as of summer 2006). I researched Libya, Tunisia, and Morocco and decided that Morocco might be the most suitable journey for me to make. I found a company called Rediscover the World, and asked them to book me a holiday near a reachable point. I also asked them to hire me a driver and car for a couple of days so as to allow me to get as close as I could to the point by road. The company booked me into a Tangier's resort, (some fifty miles/80 km from 35N 5W). They also booked me for one night into a hotel in the mountains about 10 miles from the point. Excitedly, I began to research 35N 5W. 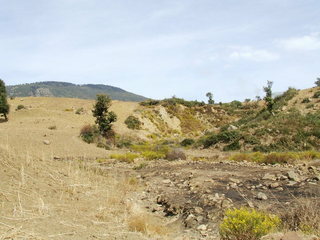 I learned that the confluence point lay in the Rif Mountains, about 1.5 miles/2.5 km from the nearest road. This seemed ideal. I'm used to hiking medium distances, so a circular walk of 3 miles/5 km would be just right. But as time passed, and I thought more about the journey, and learnt more about the area, my enthusiasm dampened. I learned the English phrase 'rif-raff' had originated from encounters with the 'troublesome' inhabitants of this region. Europeans had first entered the nearby towns only during the previous century! The centre of the world's hashish growth trade was now this region, and travellers were sometimes stopped and forced to spend all their money on the narcotic. Then I used Google maps to attempt to get a better idea of my route. I found it very difficult to zoom in on the exact spot I wished to travel to. But I did find jagged mountains and wondered where 35N 5W lay. Would it be on the top of a peak? Would a crevasse sit between the closest road and my goal? Just how vertical might the mountain side be on my route? With only two weeks to go before my trip to Morocco, skid marks were appearing in my underwear. Then, by dint of luck, I found I could type longitude and latitude into Google maps and zoom straight to the exact point specified! Suddenly I knew exactly where I'd be going. To my amazement I saw buildings were in the area, and a small track (not visible on any paper map) struck from the main road and ran close to the confluence point. In a moment, images of my journey switched from scrambling down vertical cliffs to strolling a hundred yards along a track. Fast forward a few weeks and my driver, Youssef Naciri, appeared at my Tangier hotel. Youssef is an English literature graduate of a Moroccan university and consequently had no problems in communicating his vast knowledge of the immediate area (and country in general) to me. We drove up into the Rif Mountains upon roads that looked down on valleys thousands of feet distant (sometimes from hairpin bends!). Using my GPS we knew exactly when to take the turn from the main road to the track I'd found using Google maps. As anyone who hikes will know, the view from the ground can be different than imagined from just seeing a map. This was the case for us on the track up in the Rif Mountains. We got a little lost and came to a dead-end some half mile from the point. We decided to make the rest of the journey on foot. The weather was sunny and warm. The terrain was steep, arid and uneven. Within twenty minutes we reached the confluence point. It lay in a depression near a dry stream bed. The owner of the land, a shepherd of goats, told us that no rains had fallen for a year. He would have offered mint tea but explained that as this was Ramaḍān, he couldn't. Job done, Youssef and I returned to the 4X4 and drove to the hotel in the mountains, situated above the beautiful (almost Shangri-La like) town of Chefchaouen. The following day we headed back for Tangiers. Dark storm clouds nestled on the shoulders of the Rif Mountains, and divulged rain. Despite driving reasonably, traction disappeared on one bend and we found ourselves sliding and spinning. If Youssef hadn't managed to turn the skid into the mountain's side, we might have found ourselves flying through clear air (without parachutes). Eventually, we arrived back at my hotel in Tangiers, safe and sound. Well, that's the story of how I reached the point of 35N 5W. For other Europeans who wish to be the first to knowingly reach a confluence point, Morocco might be an option. There are several points left (as of Oct 2006). Companies like Rediscover the World can help to arrange such an adventure; or, if you've already booked a holiday to Morocco contacting someone like Youssef to arrange a few days diversion might be another option. For those hoping to reach a confluence point, I'd say that it is perfectly 'do-able' as long as you are relatively fit, and plan well (make sure you get a good map of the area and become used to using your GPS system).